Army gear met high fashion at A.F. Vandevorst SS 2015 during PFW. The utilitarian wear was serious + powerful. 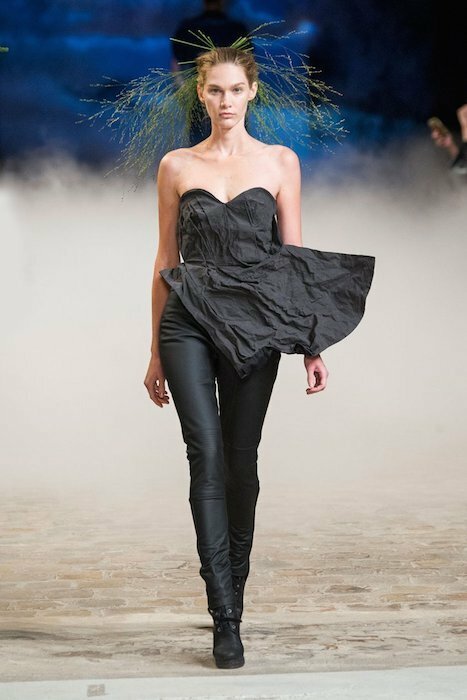 The show matched the theme with thick mist rolling over the runway and appropriately colored lighting. Favorite looks included a variety pack of jumpsuits, and pieces accessorized with lace-up over the knee boots. Alot of attitude flowed on the runway in tones of olive, charcoal, brown, khaki, and black. Sculpted silhouettes were scrunched in fabrication to give a more authentic utilitarian look. A bold red color was unexpected amongst the collection but continued the theme with a floor sweeping trench coat layered upon more reds. The masculine silhouette walked the line between tomboy and feminine, which seamed into the collection’s theme easily, all with a cool cat attitude. A.F. Vandevorst SS 2015 selects by Brigitte Segura, written by Andrea Porro.